Roads of Rome: New Generation 2 is a newly released time management game. We jump back in time to the glorious gays of the Roman Empire. It is not the easiest of times for the empire, but it is good that the citizens have Marcus and Valeria to save the day! The citizens of Rome have just been hit by an earthquake and hoped that the worst is behind, but not so at all. The empire has been attacked by the Vikings who showed no mercy and destroyed viciously the infrastructure. Valeria didn't want to be left behind and wait for the result of this attack. The famous roads, bridges and pretty much everything in between has been destroyed. Marcus, son of general Victorius, has taken upon himself to fight the attack back with his army. Valeria didn't want to be left behind and wait for the result of this attack. She pleaded her father for the authority to go through the empire and restore it with the help of the citizens. As you choose your difficulty mode (Relaxed, Easy, Normal or Hard) you probably still want to get the Expert status for each level. And that requires a strategy because once the sun sets, you are not allowed to get the expert status. 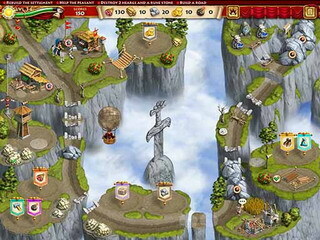 You might even have to replay quite a few levels to queue the tasks differently, for example. 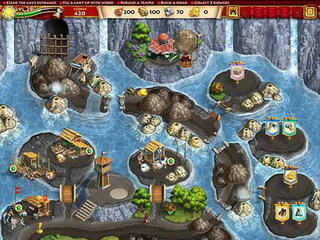 Other than that the game features a very typical for a time management game set of tasks. You build, farm, construct, collect etc... You create a whole infrastructure wherever you go because the workers need food, recourses, tools. There are a few power-ups that can speed up the process a bit. Rebuild the roads so that they could lead to Rome once again. This is Roads of Rome: New Generation 2 review. Download this game here.